Dengie Alfa-A Oil is the ultimate pure alfalfa fibre feed for fuelling hard work, improving stamina and promoting condition. 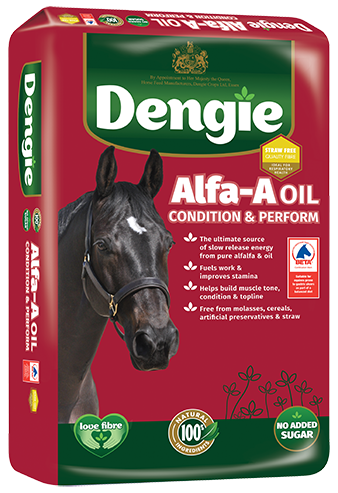 Discover five reasons why you need to feed Dengie Alfa-A Oil to power your horse’s performance! Who would have thought that Alfa-A Oil provides the same amount of energy as cereal based feeds – well it does! Alfa-A Oil provides 12.5MJ/kg of Digestible Energy but with much lower levels of sugar and starch – about 10 times less starch in fact! This means your horse receives a steady supply of slow release energy, not the peaks and troughs associated with cereal feeding that can cause behavioural issues. Oil is very energy-dense and makes an ideal addition to your horse’s diet if he is working hard and needs extra energy. It also has the added bonus of promoting healthy skin and beautiful coat shine – add Alfa-A Oil to your horses’s ration for an unbeatable bloom. Alfalfa is a great source of essential amino acids which are the building blocks of muscle tone. Yes you need to work your horse correctly to build up muscle but you also need to feed the right diet – this is why body-builders eat around double the amount of protein that the average adult consumes. Fibre is a great source of energy but it is important for lots of other reasons too. It takes 3 times as much chewing as mixes and cubes which generates lots of salvia – a great buffer to acidity in the gut. Fibre also produces heat as it is broken down in the gut – the horse’s very own central heating! Alfa-A Oil proudly displays the BETA EGUS Approval Mark as a product suitable for equines prone to gastric ulcers. Alfa-A Oil is abundant in calcium which comes from the alfalfa – a natural source that is more bio-available than inorganic sources such as limestone. This helps to create healthy hooves, bones and teeth and also helps to buffer acidity in the gut. All of this makes Alfa-A Oil the perfect addition to your horse’s ration but don’t just take our word for it. 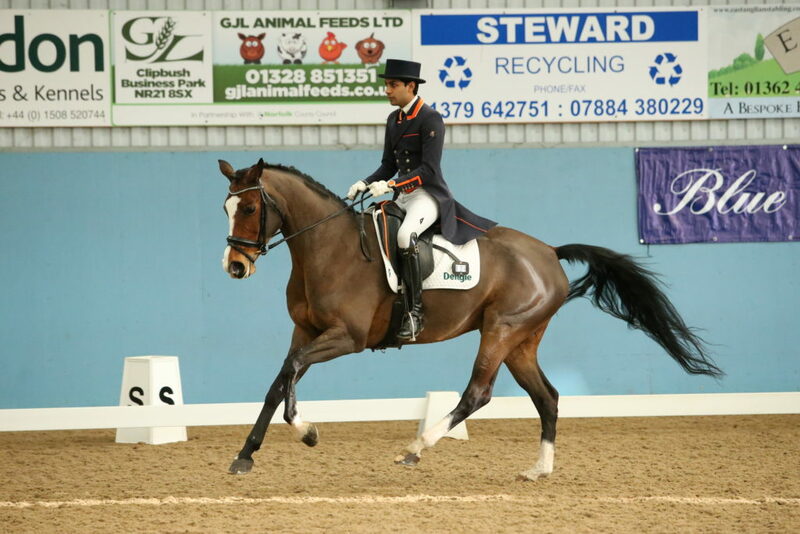 International dressage rider Anand Patel recently made the switch to an Alfa-A Oil diet for his team of dressage horses. If you would like help in making the change to Alfa-A Oil fuelling your performance this competition season, then contact Dengie’s team of nutritionists who will be happy to provide you with a personalised diet plan for the season ahead. Call the Dengie Feedline on 0845 345 5115* or complete our online feed advice form. Are these the top 3 things on your horsey wish list? 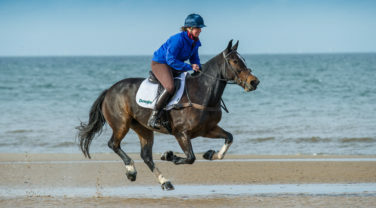 A healthy horse, a great top line and a pleasure to ride? If so, now’s the time to put more Dengie Alfa-A Original in your horse’s bucket.